4053 - 40mm case housing a Frederic Piguet Cal. 1153 movement. 36 – Rose Gold, 42 – Opaline Dial. 55 – Leather strap with tang buckle. Function Two hands, time only. I bought this watch in February of 2003. In February 2004, I wrote a one year review. In February 2005, I wrote a two year review. Now, in February 2006, it's time for my three year review. This watch continues to be my everyday work watch--I wear it most weekdays. Because this watch is, for most people, a dress watch, it is unlikely there are any other owners who wear this piece as often as I do. I have worn this watch for a total of about 700 days. I'll go out on a limb and assert that I have used, examined, and admired this watch more than anyone else in the world. In fact, I daresay I have more experience wearing this watch than even the designers and watchmakers at Blancpain. It turns out I'm too lazy to bother to keep a detailed log so the timing can be calculated. A timing machine would allow me to get instant results but I'm not just lazy, I'm also cheap, so I don't own one. But the very fact of my ignorance provides two pieces of good news: 1) the watch is accurate enough, it's just not an issue. And 2) my psychotic obssessions are not (yet) out of control. Hooray! The time has come, finally, to discuss problems and design mistakes. After 3 years, the honeymoon is over so I should be able to objectively see the problems with this watch. Before I begin though, I'd like to remind everyone that this is still a stunningly beautiful watch and I love wearing and studying it. It will continue to be my daily wearer for a fourth year and I have no intention of ever selling it. The problems mentioned here must be kept in perspective: they are minor compared to the overall aesthetic which is still unparalleled in all of watchdom. With that in mind, here are some issues that have finally revealed themselves. I didn't think (and in fact have never met anyone who thought) the direction of winding mattered. But it does. Here's the problem. If you consider the most violent action you might perform with your forearm during a day it is likely directed away from your body. When that movement stops, the rotor in your watch continues on and spins. 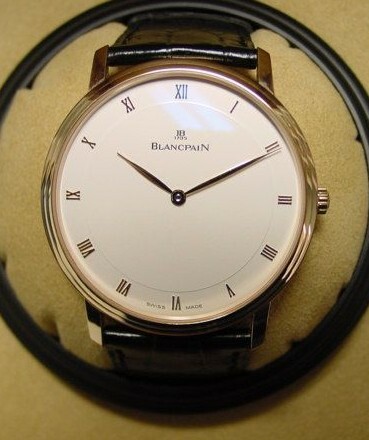 This can either wind the watch (as a typical CW winder does) or free-wheel (as this CCW blancpain does). This all means that there are a few times during the day when you will feel the rotor spinning wildly within the case. Perhaps this delecate 3mm thick movement with its intricate double barrel winding system was designed to not wind in these extreme cases so any likely violent forces are not transferred into the winding works. In that case, lifespan may be improved by such a decision. The bottom line is, with the rotor able to free-spin counter-clockwise (when viewed from the dial), a bout of free-spinning occasionally does make itself felt, while no CW-winding watch I own has ever behaved this way to attract my attention. When looking at this watch, it looks generic enough that it might have been produced in 2000 or, just as likely, in 1900 or even 1800. This timeless design is just what I wanted in a watch which I'm hoping lasts 500 years. However, the details of the design do hint at the era it was made. First, the lugs are too short. There, I said it. Even with curved springbars, the middle of every strap rubs on the case at 12 and 6. If the lugs were longer, the strap could have been spaced further from the case. This flaw has and will continue to reduce the lifespan of my straps and will eventually wear flatspots into the case. This indicates that the watch must have come from around 2000, since longer lugs were the norm for earlier watches. There is nothing about this watch which is ugly, but physical damage to the case is inevitable. How is the soft 18k gold holding up? The entire case has begun to show a slight patina where the gold softly glows in the light rather than throwing harsh sharp reflections. This year I've added 2 new straps to my collection bringing the total to 5. There's now a ridged waterproof strap in brown leather and a thick padded tan ostrich with constrasting stitching. In February 2013, I wrote a 10 year review. This continues to be my only 'good' watch. And even after three years of close daily examination I still believe this is the world's most beautiful watch.